Description: Erect multistemmed perennial subshrub to 1 m high, stems terete ribbed, tomentose to scabrous. Leaves obovate to elliptic, 0.9–6 cm long, 5–42 mm wide, margins entire or toothed, upper surface glabrous and often scabrous when mature, lower surface usually grey or rarely golden-brown tomentose; sessile or shortly petiolate. Flowering branches 2–9 together, usually covered with brownish hairs, 3–5-flowered. Sepals obscured beneath hairs, to 0.5 mm long. Corolla 12–15 mm long, outside with loose usually dark grey hairs; wings l.5–2.5 mm wide. Fruit 4–5 mm long, ribbed beneath hairs. 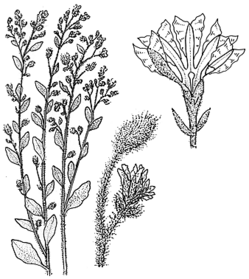 Distribution and occurrence: Grows mostly in sclerophyll forest and heath; widespread on the coast and ranges, inland to the Warrumbungle N.P. and Cootamundra district.